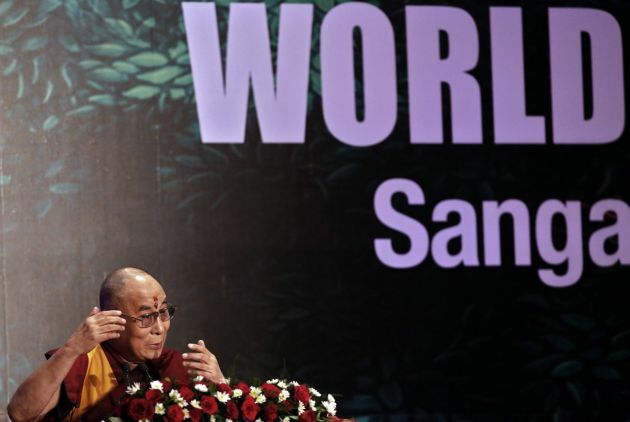 (Photo: REUTERS / Anindito Mukherjee)Exiled Tibetan spiritual leader, the Dalai Lama, speaks during the World Hindu Congress 2014 conference in New Delhi November 21, 2014. Nobel Peace Prize Laureate Archbishop Emeritus Desmond Tutu has appealed to Pope Francis to reconsider meeting the Dalai Lama saying he is deeply saddened by the Vatican's decision. "I am very aware of the dilemma in which so many have been finding themselves with regard to their relationships with His Holiness and the People's Republic of China," Tutu said in a statement on December 15. Nobel Peace Prize laureates met in Rome at the weekend but after Pope Francis had refused to grant an audience to Tibetan Buddhist leader the Dalai Lama, the 1989 laureate, for fear of offending China. "Pope Francis obviously holds the Dalai Lama in very high regard but he will not be meeting any of the Nobel laureates," a Vatican spokesman had said. He said the Pope was to send a video message to the conference of Nobel Prize winners, after it had moved the venue from Cape Town after South Africa refused to give the Dalai Lama a visa. "I am deeply saddened and distressed that the Holy Father, Pope Francis, should give in to these pressures and decline to meet the Dalai Lama," said Tutu who won the Nobel Peace Prize in 1984. The former leader of the Anglican church in South Africa noted that the Dalai Lama preaches peace, co-existence and compassion. "What he seeks for his people is not secession from China, but autonomy that is provided in the Chinese Constitution so that they can carry out their customs, language, literature, music and faith, which are under great threat," Tutu said. The retired archbishop said he has the "highest admiration" for Pope Francis who is living a simple and admirable lifestyle and he has given the Roman Catholic Church and Christendom a new sense of pride. The laureates' Rome meeting was originally scheduled to take place in Cape Town in October. But the government of South Africa President Jacob G. Zuma, which has close economic ties with China, refused to grant the Dalai Lama a visa. The Pope's refusal to hold a meeting with the Dalai Lama for fear of upsetting China was also criticised by a fellow 1997 Nobel Peace Prize winner Jody Williams. "Where is morality, when the spiritual leader in Rome bows in one way or another to economic pressure from China?" "His Holiness is a spiritual leader," she said. "I hear unfortunate things that the spiritual leader of this capital is loathe to upset China and meet spiritual leader to spiritual leader."